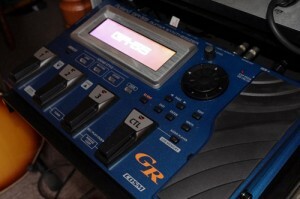 I haven’t upgraded my gtr-synth since the GR-1 and I have utilized that great box since day one with terrific results. Pardon my lack of knowledge about any of the last two decades of Roland gtr-synth offerings, but I’m just wondering if the 55 is a unit that one can update via the USB if/when Roland has updates for patches, funtions, etc. Have any of the units, either VG’s or GR’s offered downloadable updates? Thanks for your feedback? 1) You download the firmware from Roland and a MIDI player application. 2) Unzip the firmware folder. That’s it. I’ve upgraded the VG-99 this way and my Boss DR-880 drum machine too. As for upgrading patches, the VG-99 has its own patch editor software and I know that Roland Japan (or US, not sure which) released a set of complimentary patches that you could load into your unit via the editor software. The GR-55 doesn’t have its own dedicated Roland software editor yet, but it might be something for the future. Thank you Darren. I suspected as much as it only seems appropriate to offer updates as the unit, or the technology is further developed. Is it possible to loop the USB audio files? The USB file player just allowed you to start and stop playback. It works like this: one pedal cycles back through your list of files, the other pedal cycles forward and the third pedal just starts and stops playback. The looper function allows you to build up 20 seconds of stereo looping. It’s good fun, but not as powerful as anything in the RC range of loops (obviously). Also, you can’t save the loop. thanks Darren! Very helpful feedback! Can the GR55 be used to trigger other soft synths within a digital recording program? In other words as an all around midi controller? The GR-55 can output MIDI data via USB to your DAW software, so you can trigger MIDI synths. For the life of me, I can’t get my new Godin Multiac Spectrum to track properly. I am mostly wanting to use it for switching altered tunings on the fly. Any help would be appreciated, Darren. Hi Darren, I’m new to all Synth stuff! What PU setting do I need to use on the GR 55 for a Godin Nylon SA like yours. What about sensitivity settings? Factory setting is GK-3. Should I use Piezo? There are different types. You use the settings recommended in the manual. As for sensitivity, you should adjust the sensitivity to your own tastes. Again, consult the manual with regards to the different types of piezo pickups. If you don’t have the manual, it can be downloaded from the Roland/Boss website. nice report about the GR 55. I´ve got one question: would you say, that the GR55 sounds really better than the GR 33? I could buy a used GR 33 but also a used GR55, but the GR 55 costs twice as much. I was looking into you tube your video of the Godin guitar along with the Roland GR-55. Is perfect!!!! I have a Godin and decided to purchase the Roland GR-55 but have not being able to setup the guitar/pedal through the 13 pin connection on my guitar. Can you send me the settings in order for me to finally set this amazing pedal and try to replicate all the nice sound you displayed in the youtube video? I am a amateur guitarist, and live in Puerto Rico. The settings I use are the settings straight out of the box. Sorry, I cannot give any further help – but the key is to experiment to find best way to get the GR-55 to work for you. Darren, my compliments for your setup and playing. I’d like your opinion and help: I am trying to setup DAW recording with my Logic Studio and my guitar. What’s your suggestion as to how to trigger the synth sounds in the DAW with the guitar? You install the MIDI drivers and route the MIDI into Logic that way – or you do it via the MIDI out on the GR-55 into a MIDI interface connected to your computer. I personally wouldn’t bother though because triggering will not be as good as using the GR-55 and you are more likely to trigger random notes in the soft synth. The synthesiser built into the GR-55 was designed for use with guitars and a soft synth isn’t. I recently bought a Godin Nylon SA. I am wondering how a Roland GR-33 or GR-55 emulates and electric guitar sound. I need just one, decent, clean and distorted guitar sound, that I can use with my band during live performances. The distored sound has to be somewhere in that “AC/DC” range. I just need to produce some power chords in a live performance and I am concered as to how well this can be done via the Godin Nylon and if either the GR-33 or 55 can deliver? Anyone? Thanks! Yes, the GR-55 would be ideal for you because you can either use a synth distorted guitar sound or route the guitar output from the pickup to the GR-55 and put it through its guitar effects chain. Nice site! How is the Roland GR 55 compared to the Axon MK II? I can’t answer that. Never used the Axon. I am a strictly Roland boy, I am afraid. (mixing with the gr55 when required)……and WITH ONE AMP ?….If anyone has done this can you send me a wiring diagram ??? ?…….anyones help would be very gratefully received….thanks . You probably won’t need your GT10 as the GR-55 has very passable COSM guitar FX. But back to your question, you can route the guitar out of the GR-55 into your GT10. As for routing this into one amp, I would suggest you invest in a small mixer, perhaps? What is the best guitar to use with the GR-55. I don’t want to put the pickup on any of my guitars. Ive been looking ar the Roland Strat and the Godin. The Roland GK-3 pickup will always give the best performance because it was designed specifically to work with the GR-55 and all the Roland GK compatible products. But the Godin works well for me. It’s all subjective. Maybe you should check out the new Roland GC-1 guitar that’s released this year. I’ve only spent a couple of hours with the GK55, but can’t work out an easy way to bypass everything and just use my normal guitar pickups with no effects. I don’t want to be changing cable jacks to do this. I just want to press a button. Am I missing something obvious? I don’t think you can just bypass the effects and use the guitar per se. One option would be to set up a patch which just has the bare signal and effects that you want and switch to that or route the guitar out to separate mixer/amp (it’s a line-out on the back of the GR-55). Hey there, Nice site, first of all! I find that I like to run the GR55 into an amp via the guitar out, and then use the GR55 for all my effects and stuff. (I actually have my guitar out go into a Rapco A/B splitter and then it goes to all kinds of stuff…) Anyways, when I like to just have pure unadulterated guitar tone (I love my Marshall…) I just set the switch to ‘guitar’ on the GK3. Seems to work good! I use Logic too, and I find that the GK3 seems to track stuff not too bad in there as software instruments via midi. Tracking still needs work, but pretty good so far… Anyways, Check out my gr55 vids and stuff on my website if you like, thanks and keep up the great work on the site!